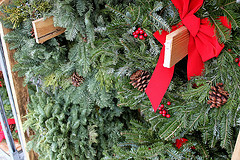 Holiday wreaths will be distributed for members of the Lefferts Manor Association this December. The deadline to join the LMA or to renew your membership in order to get a wreath is Saturday, November 20, 2010. The wreaths will be delivered on Saturday, December 4, 2010. Volunteers are warmly welcomed to help tie on bows and deliver wreaths. LMA Board members will be organizing volunteers on their blocks. A flyer with more details will be distributed before November 13th. This flyer will have an up-to-date lists of members, so you will be able to check your membership status. If you have any questions (or want to join or renew now), please email leffertssupport@gmail.com.